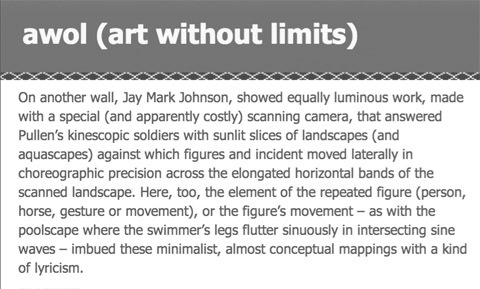 On another wall, Jay Mark Johnson, showed equally luminous work, made with a special (and apparently costly) scanning camera, that answered Pullen’s kinescopic soldiers with sunlit slices of landscapes (and aquascapes) . . .
Read the full posting by Ezrha Jean Black on AWOL here.